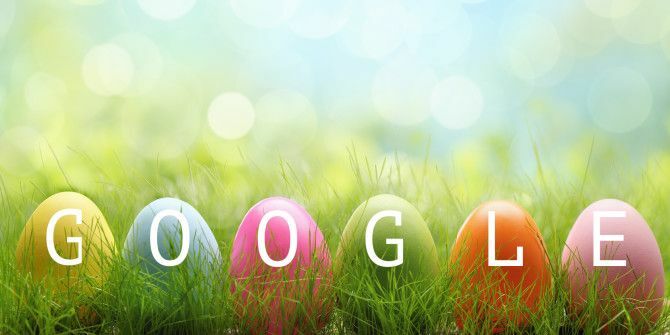 Google’s geeky sense of humor shows up every now and then in the form of cool Easter eggs Ten Google Easter Eggs You Missed Somehow Ten Google Easter Eggs You Missed Somehow While technology is cold, it's still made by humans. Where there's a human, there's a sense of humor. Often, engineers slip a fun secret into their code — an Easter Egg. Read More . Here are a few that are hidden in the search engine that you might not have known about. 1. Flip a Coin: Desperate times call for “toss a coin” decision making Indecisive? Make The Right Choices With These Apps Indecisive? Make The Right Choices With These Apps Have you heard of the paradox of choice? If you're like me and suffer from analysis paralysis, these apps will change your life. Read More , and Google is there to help you if you don’t have a coin handy. Type in flip a coin in Google search and hit the I’m Feeling Lucky button. You’ll get either Heads or Tails in response. 2. Google Gravity: Type google gravity in Google search and click on I’m Feeling Lucky. All the elements of the Google home page tumble down in an amusing demonstration of gravity. The search function still works, but the results of each query pile up on top of each other. Google computes that complex bit of math and turns it into a graph, which happens to look like a little blue heart. Google has many more tricks up its sleeve. See which other lesser known Easter Eggs you can discover. We bet that’ll be fun to do! Which other unusual Google search queries do you know of? Tell us about them in the comments. Explore more about: Easter Eggs, Google Search. If you can't click the I'm feeling lucky button, you can go in the settings on the bottom right of the google page and select 'Search settings'. Next click the option 'Never show instant results'. Now the I'm feeling lucky button will stay on the page and will be clickable. Don't forget to memorise or write down the orriginal setting to revert to the previous state should you want to. Goole gravity - you can mouse grab the fallen items and toss them in the "air" and watch them fall. That's really cool, Greg. Thanks for pointing it out. There is no I'm Feeling Lucky button on my google search page - I'm using firefox. Any clues? You're not actually on the Google home page. You're on FF version of it. You can just go to http://www.google.com so see the I'm Feeling Lucky button. I mean bookmark and share (FB, Tweet, Pin, @) buttons are between article and comment section. This is the worst place where could be. I prefer the top of page because I can check my bookmarks without scrolling (or page down button). By the way I can't see my bookmark at the article. I can see any bookmark only in "my bookmark" menu section. I can't see my bookmark in Android app neither (even it mentioned in play store). Google Gravity doesn't work anymore, since you can't click "I'm feeling lucky." Now when you type in the search bar, it goes up to the URL field and the "I'm feeling lucky" disappears. I suppose you can turn off the "instant results" feature. Yeah, that I tried that from google.com, Pam. It works from there. You can actually click I'm feeling lucky, but since google uses a new layout, the I'm feeling lucky appears on the right of the proposed searches if you move the mouse pointer over them. Just make sure you click on the one asociated with what you typed in the search box. If you click on another one you will get other results. If your search isn't in the drop down, try typing a space after your search. Sometimes that helps. In relation to flip a coin, Google can also "roll a dice." Thanks for pointing that one out, Leah. It's funny but YouTube has better easter eggs. By the way I don't like new positon of your buttons. This is very inconvenience. I prefer top of page because I don't like paging too much. I'm not sure which buttons you are referring to, Karoly. Could you please be a little more specific? I mean bookmark and share (FB, Tweet, Pin, @) buttons are between article and comment section. This is the worst place where could be. I prefer the top of page because I can check my bookmarks without scrolling (or page down button). By the way I can’t see my bookmark at the article. I can see any bookmark only in “my bookmark” menu section. I can’t see my bookmark in Android app neither (even it mentioned in play store).